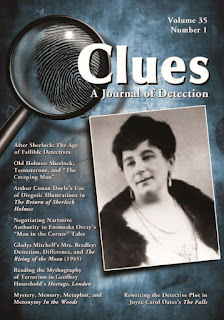 The Bunburyist: Clues 35.1: Conan Doyle, French, Mitchell, Oates, Orczy et al. Clues vol. 35, no. 1 (2017) has been published. Contact McFarland to obtain a print copy of the issue or to subscribe to the journal. In the wake of Sherlock Holmes’s success, writers and critics explored the relationship of the fallible detective to the ideological and aesthetic characteristics of the Golden Age. The author examines this phenomenon, shedding light on the transition between the infallible detectives of positivism and the vulnerable detectives of post–World War II psycho-thrillers. Arthur Conan Doyle’s “The Creeping Man” captures the early–twentieth century’s interest in male menopause and hormone replacement. The now-retired Sherlock Holmes and the aged Professor Presbury embody the conflict between aging as diminishment and aging as healthy and vigorous, a conflict still affecting readers who hesitate to accept Holmes as elderly. Four stories from The Return of Sherlock Holmes in the Strand Magazine and Collier's Weekly featured hand-drawn maps and other visual material supposedly created by Arthur Conan Doyle’s characters. These peculiar diegetic phenomena serve an ambivalent, even contradictory, function, both drawing in and repulsing the reader. The author argues that relations of scale are central to the late-nineteenth-century detective fiction of Arthur Conan Doyle, in which the movement between large and small, far and near, and the distant and the intimate is condensed by making Sherlock Holmes’s own vision the locus of that movement. Critical studies of Baroness Emmuska Orczy’s “Man in the Corner” narratives have been dominated by the collected edition The Old Man in the Corner; however, this edition fundamentally alters the dynamic of the original stories. Revisiting the original tales, this article interrogates the relationship among detective, narrator, and reader. A sharp sense of parody leavens the realist modes of Gladys Mitchell (1901–83), producing novels that both abide by and subvert the rules of Golden Age detection. The Rising of the Moon (1945) is her finest novel, one that uses its formal “play” to register moving questions of human desire and agency. Although the Nancy Drew mystery series has had a consistent readership, very little early scholarly research was done on the books or the character. The journal literature from 1930 to 1993 reveals four areas of study: Nancy’s independence, her sexual identity, racial and ethnic stereotypes in the books, and business and legal issues regarding the books and film adaptations. Framed as a fictive diary, Geoffrey Household’s Hostage, London (1977) addresses the threat of nuclear terrorism in the West. Through his narrative, protagonist Julian Despard struggles to understand his divided allegiances, documenting the moral vacuity of ideologically driven terrorism. Five mysteries by Tana French take place in the woods near Knocknaree, Ireland. Through metonymic associations of the woods, as well as narrative techniques from hard-boiled and gothic traditions, French examines issues related to the mutability of memory, the lingering effects of the past on present lives, and the economic shifts affecting Irish identity and society. A growing number of Joyce Carol Oates’s novels are a peculiar sort of “whydunit.” In Oates’s The Falls (2004), her detectives occupy a middle ground between the Golden Age detective and the hard- boiled hero—one example of the metaphysical detective story in her fiction that resists even this wide-ranging designation. Jack Reacher, created by British-born Lee Child, rejects the myth of the American dream in all its guises and straddles two emblematic American genres—cowboy and hard-boiled detective fiction—in his quest for absolute, utopian freedom. Paradoxically, this turns him into a quintessentially American character. Foxwell on mystery reviewing, EQMM blog. Conan Doyle works at UNC Chapel Hill. "The Thirty-Two Friends of Gina Lardelli" (1959). On early Sherlock Holmes fandom. The unique world of Harry Stephen Keeler.